The solemn times in which we are living. The urgency to spread the gospel truth. Although many of these individuals, perhaps even you, are evangelist and missionaries “at heart”, circumstances (i.e. careers, family responsibilities, etc.) may limit your ability to physically carry out the work. Despite these limitations, you may still join our ministry and take an active part in finishing the work by means of your prayers and financial support. 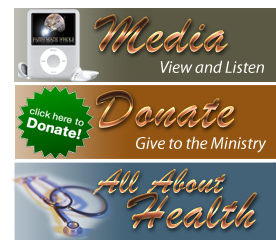 As the Spirit of God impresses your heart, we welcome and appreciate any financial contributions and donations. © 2011 Copyright Faith Made Whole. All Rights Reserved.